After co-inventing the breathe-on-demand valve for SCUBA diving, Jacques Cousteau led hundreds of marine expeditions, making three Oscar winning documentaries. His pioneering television series The Undersea World of Jacques Cousteau promoted human understanding of ocean life, with Cousteau and his crew doing things never seen before, such as swimming with whales, caressing octopuses, and being pulled along by giant turtles. He was the first person to propose that cetaceans, such as whales and porpoises, use echolocation to navigate. 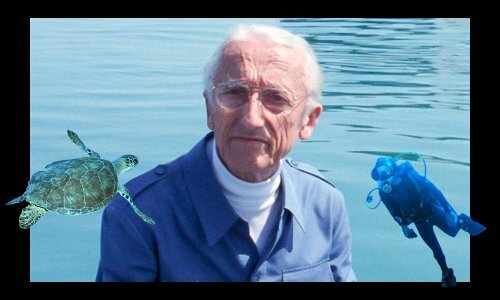 Jacques-Yves Cousteau was born on June 11, 1910 in Saint-André-de-Cubzac, near Bordeaux, in France. He learned to swim when he was just four. His father, Daniel Cousteau, was an international lawyer. His mother, Elizabeth Duranthon, was the daughter of a wealthy local wine merchant and landowner. At age 10, Jacques moved with his family to New York, USA, where they lived for two years. Jacques learned to speak English fluently and improved his swimming and snorkeling. At summer camp in Vermont he started diving as part of the camp’s policy of cleaning up the nearby lake, the beginning of his life-long love of swimming underwater, even though he had no goggles. When the family returned to France, they moved to the Mediterranean city of Marseilles, where Jacques snorkeled in the warm sea around the city. He also bought a movie camera, which he took apart and reassembled, learning how it worked mechanically. Concerned at their son’s lack of academic progress and lack of discipline (he had gone on a window-smashing spree) his parents sent him to a tough boarding school in France’s Alsace region. The strong discipline worked wonders for the boy. In 1930, age 20, Jacques Cousteau passed the tough exams for the French Naval Academy in Brest, where he trained for two years before spending a year at sea. In 1933, he was commissioned as a second lieutenant and spent most of the next two years sailing the world’s seas. In 1935, Cousteau started training to become a naval aircraft pilot. He had almost completed his training when, in 1936, he was involved in a near-fatal car crash. Traveling too fast on a bend, his car lost grip and flew off the road. Cousteau awoke in hospital to discover with horror that his right side was paralyzed. In addition to this he had a dozen broken bones, including multiple fractures in both arms. Surgeons thought it best to amputate his paralyzed right arm, which had become infected. Although the infection was life-threatening, Cousteau insisted his arm should not be amputated. He survived, but his career as a pilot was over. After months of therapy, much of it spent swimming to increase the strength of his shattered bones, he became a naval gunnery instructor. Cousteau now swam daily to strengthen his arms. He improvised a pair of early swimming goggles from aircraft pilot goggles and swam down to explore the sea floor. The beauty of the sea-floor and its flora and fauna made such a deep impression on him that he decided he wanted to make diving his life’s work. In the early part of World War 2 Cousteau was serving as a gunnery officer when French ships bombarded the Italian naval base at Genoa close to the border between France and Italy. Cousteau thought about his Italian friends and felt deep despair. After France surrendered to Germany in 1940, the southern part of France was governed by the Vichy regime – a French government that cooperated with the Nazis, causing more despair for Cousteau. During the war, Cousteau also began the work for which he would become world-famous. In 1942, he and his friend Marcel Ichac took an underwater camera to the waters around the Embiez Islands in the French Mediterranean. They made a film undersea called 18 Meters Deep. The following year, the pair were awarded an arts prize for their work. 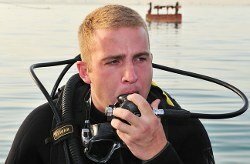 A diver breathes through his regulator, checking it is working properly before diving. Meanwhile, Cousteau had grown frustrated with the breathing equipment available for divers. Self-contained underwater breathing apparatus (SCUBA) had been invented in 1926 by another Frenchman, Yves Paul Gaston Le Prieur, but air flow to the diver from the air tanks on his back was poorly regulated, with the result that time underwater was very short. Cousteau had earlier experimented with breathing pure oxygen rather than air, hoping this would allow him to remain underwater longer. However, oxygen toxicity at depths below 45 feet caused him to lose consciousness: he abandoned the idea of breathing pure oxygen. Cousteau then tried to find a better way to control air flow to the diver. The demand regulator had been invented in 1942 by Émile Gagnan, a French engineer, to control gas flow in engines. The demand regulator only allowed gas through ‘on demand,’ not continuously. Cousteau saw the potential for such a valve for divers: air would be fed to them only when they breathed in, and so their supply would last longer. Cousteau made suggestions to Gagnan about modifying his valve. And so, in 1943, the diving regulator or aqualung was born, co-invented and patented by Gagnan and Cousteau. After the war ended, Cousteau began underwater research for the French Navy. In 1947, he set a new depth record for a free diver, descending 300 feet under the sea. In addition to military work, such as mine clearance, in 1948 Cousteau used his new SCUBA equipment for underwater archeology work, exploring a sunken Roman wreck in the Mediterranean off the coast of Mahdia, in Tunisia. In 1951, Cousteau took scientific leave from the Navy and began his own sea expeditions. Cousteau shared his plans to make undersea film documentaries with wealthy British philanthropist Thomas Loel Guinness. Jacques Cousteau’s expedition ship, Calypso, became so well-known that model makers, such as Revell, began making kits for people to build their own scale-models of the ship. Guinness was highly enthusiastic and decided the best way he could help Cousteau was with a ship. In 1950, Guinness bought a former car ferry and leased it to Cousteau, who was now 40-years-old, for a token 1 franc a year. The ship’s name was Calypso. Like Cousteau, it was destined to become familiar to TV audiences all over the world. Although he now had a ship at virtually no cost, Cousteau needed to equip it and crew it. This was terribly expensive, and Cousteau begged for government grants and pleaded with manufacturers for free equipment. To raise more money, he and Frédéric Dumas coauthored the 1953 book The Silent World, a book about their pioneering adventures in SCUBA diving. The book was an instant hit, and has continued to sell; to date it has sold over 5 million copies. In the book, Cousteau made the first ever suggestion that members of the whale family are able navigate using echolocation. He deduced this from observing their behavior entering the Straits of Gibraltar. In 1956, Cousteau released his first color movie documentary, called, like his earlier book, The Silent World. The movie was transformational, changing forever people’s ideas about the oceans and the life they contain. Today, most of us have seen plenty of undersea footage, but until Cousteau released The Silent World, only a tiny number of people had any idea of what the undersea world looked like. The movie won Cousteau the 1957 Academy Award for Best Documentary. A lot of marine life was killed during filming of The Silent World, including many sharks and a baby whale (by accident). In more recent times Cousteau has been criticized for this, although, given that he became one of the world’s greatest advocates of marine conservation, he must have come to regret the deaths. After the film’s release, there was huge demand for SCUBA equipment, including Gagnan and Cousteau’s diving regulator. A great many people desperate for adventure were inspired by Cousteau to take up SCUBA diving. He had captured the world’s imagination. Cousteau officially retired from the French Navy in 1956 with the rank of Captain. In 1960, the year of his fiftieth birthday, Cousteau’s new documentary, The Golden Fish, won the Academy Award for Best Short Film. In the same year, he was featured on the front cover of Time Magazine. In his interview with Time, Cousteau predicted that one day people would have gills surgically added to enable them to live underwater. In 1961, President John F. Kennedy presented the National Geographic Society’s Gold Medal to Cousteau. The bases, the Conshelf bases, were partly funded by French oil companies who were interested in exploring the sea-floor. In the end, Cousteau decided he would rather work in conservation than oil-exploration and abandoned the idea. Nowadays, sea-floor exploration is carried out at lower cost and lower risk using underwater robots. The documentary Cousteau made about establishing the Conshelf bases, World Without Sun, won him his third Academy Award, for Best Documentary, in 1965. In the years 1968–76 Cousteau produced probably his best known work, the TV documentary series The Undersea World of Jacques Cousteau. It ran for eight seasons, with some narration from Cousteau himself in his uniquely French accented English. The Undersea World described the adventures Cousteau and Calypso’s crew were having and the marine species they were observing. The crew by now included his sons, Philippe and Jean-Michel. The Undersea World of Jacques Cousteau inspired yet another new generation of divers and marine biologists. In 1985, on Cousteau’s 75th birthday, President Ronald Reagan presented him with America’s highest civilian honor, the Presidential Medal of Freedom. In the same year, Cousteau invited Cuba’s Communist leader, Fidel Castro, for dinner on Calypso and persuaded him to release 80 political prisoners. At age 26, Cousteau married Simone Melchior on July, 12 1937. They had two sons, Jean-Michel and Philipp. Simone always traveled with Cousteau on Calypso and once sold her jewels to buy fuel to keep the ship at sea. Simone died of cancer in 1990. In 1991, Cousteau, who was by then in his eighties, married Francine Triplet. They already had a daughter, Diane, and a son, Pierre-Yves, born in the early nineteen-eighties, while Cousteau was still married to Simone. Near the end of his life, Cousteau had a legal battle with his son, Jean-Michael, over his son’s wish to use the Cousteau name for commercial purposes. "Jacques Cousteau." Famous Scientists. famousscientists.org. 29 Jun. 2015. Web. Image of David Bellamy by Allan Warren, Creative Commons Attribution 3.0 Unported.